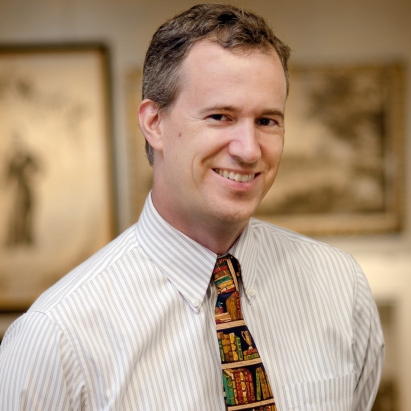 This year marks the 20th annual auction for this department, which focuses on everything from colonialism in Africa to the diaspora, from the Civil War to the Civil Rights era and beyond. 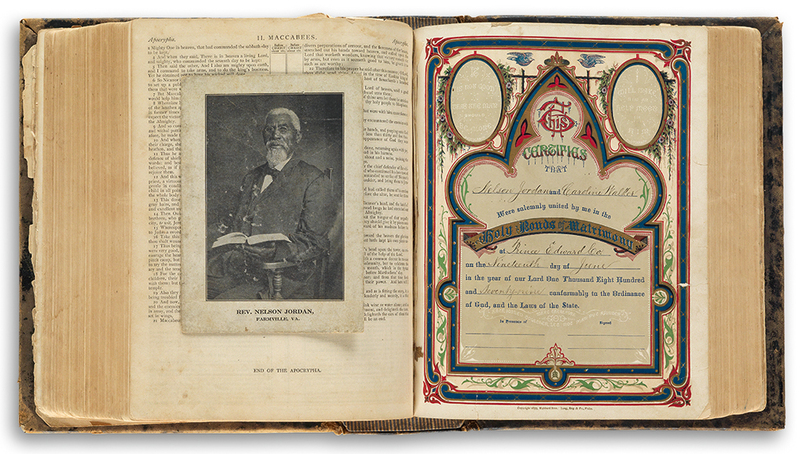 Lot 260: Family bible from the archive of Reverend Nelson Jordan, 1860s-1960s. Sold for $27,500. Featured in this auction is the exceptional family archive of Reverend Nelson Jordan, circa 1860s to 1960s, with photos, documents, letters, the minister's frock coat and top hat as well as a huge family bible. Also on offer is the earliest printed Black Panther poster, Move on Over, or We Will Move On Over You, 1960s. A Tuskegee Airman's leather helmet with goggles and earphones, his wings, battle ribbon, photographs and dog tag are included in the sale. 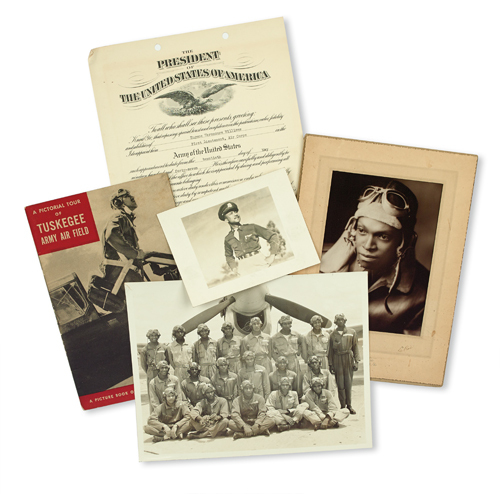 Right, Lot 380: Archive of over 300 items relating to Tuskegee Airmen Lieutenants Leroi S. Williams, Eugene W. Williams and Second Lieutenant James T. Williams, including photographs, official documents, letters and ephemera, 1943-49. Sold for $10,400. Lot 415: E. Simms Campbell, A Night-Club Map of Harlem, pen and brush on board, 1932. Sold for $100,000. 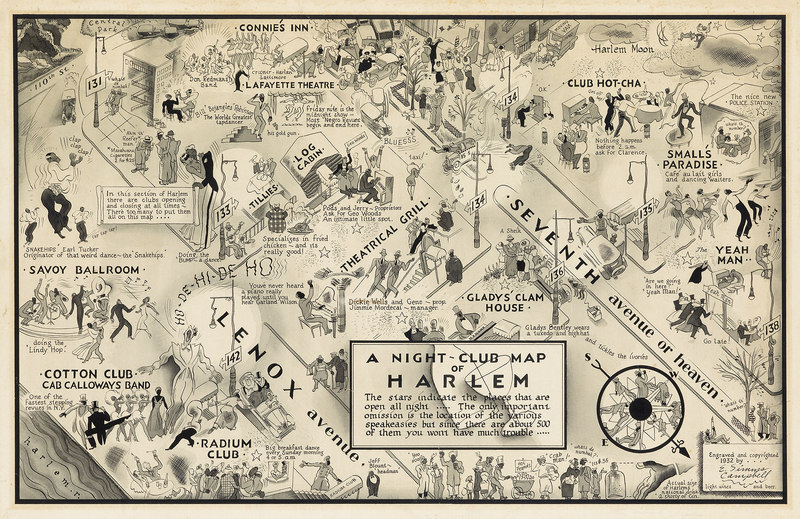 Another highlight is A Night-Club Map of Harlem, the original artwork for the well-known print that was originally published in the first issue of Manhattan Magazine in 1932, and printed again a year later in Esquire. The map functioned both as a guide and a who's-who of prohibition speakeasies and night clubs that dotted the Harlem landscape. The artist, E. Simms Campbell, became the first African-American illustrator to be syndicated and whose work was featured regularly in national periodicals. Other historically significant items include A Narrative of the Most Remarkable Particulars in the Life of James Albert Ukawsaw Gronniosaw, and African Prince, as Related by Himself, Bath, 1770, the earliest published English-language slave narrative; and Scott Joplin's first published song, "Please Say You Will," 1895. In addition, there is W.T. Sherman's controversial Special Field Orders, No. 15, 1865, giving "respectable negroes... forty acres of tillable ground." All this, plus early photography, rare books, pamphlets and a possibly unique copy of Ida B. Wells-Barnett's periodical, Woman's Forum, 1922, were up for auction. 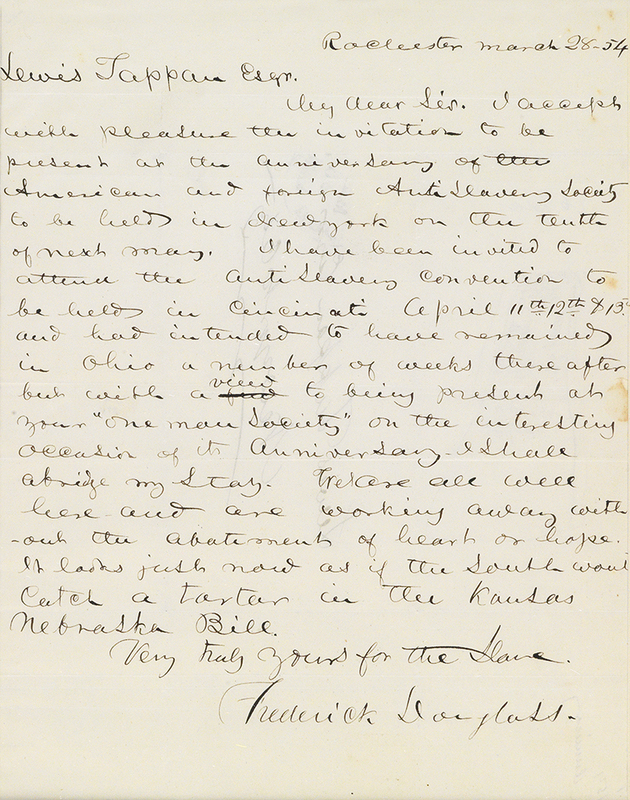 Left, Lot 51: Frederick Douglass, Autograph Letter Signed, to abolitionist Lewis Tappan, 28 March 1854. Sold for $22,500. contact Specialist Wyatt Houston Day.